Requirements for air mailInfectious substances in Category A will not be accepted for shipment through postal services. 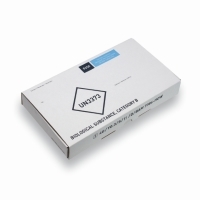 Infectious substances in Category B may be shipped by registered air mail, and the Universal Postal Union recommends the following procedure.The basic triple packaging system is used with the same requirements as for other means of transport. The address label shall display the word “Lettre” or “Letter” and the green Customs Declaration Label for Postal Mail is required for international mailing. “BIOLOGICAL SUBSTANCE, CATEGORY B” shall be identified with the white diamond label with black letters “UN 3373”. Local/international restrictions may be in force. Prior contact should therefore be made with the national public operator to ascertain whether the packaged material will be accepted by the postal service in question. Special designed for extreme circumstances (520100 category A or 520125 category B) size 100 x 100 x 180 mm. 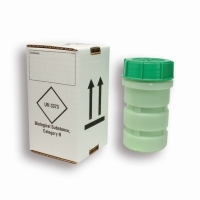 The box is a complete system to transport for example 4 tubes of 10 ml. 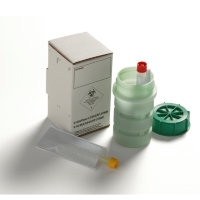 Medical mailing packaging and products for mailing diagnostic samples have very specific requirements. UN3373.com provides a specialised range which complies with international regulations, like the IATA, ADR. Our packaging is aproved. Our packaging is accepted by most Post en couriercompanies, like TNT and DHL. Biological Substances, Category A shall transported by certified couriers! Couriers should be reputable and experienced in transporting material of this nature. If relevant, arrangements must be made by the shipper to ensure that the operators are able to carry consignments containing dry ice. If the specimens are being consigned by air, it is essential that a courier is employed and that they are consigned as freight – samples are not permitted on aircraft in hand luggage, checked-in baggage or carried on the person.